Strengthen your immune system by finding and maintaining inner harmony. Do you want to develop your inner strength and discover new ways of mastering everyday tasks and problems? With Your Final Breakthrough: Active Healing, Better Health, you will — effortlessly, quickly, and completely lead a more fulfilled and balanced life ... bring more relaxed attitudes to everything you do ... allocate your energy effectively to give yourself more time and space. Your Final Breakthrough series uses the latest discoveries in the sciences of sound, psychology, and superlearning to create a completely new, totally safe, and thoroughly effective psychotechnology that reprograms your subconscious in positive ways to achieve the goals you seek. Its natural approach avoids subliminals to guarantee a pleasant, life-changing experience. 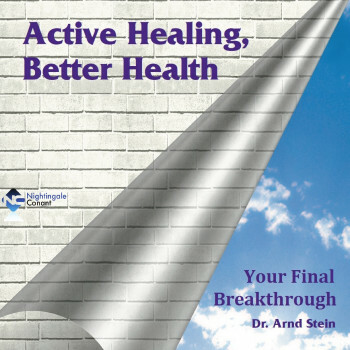 Dr. Arnd Stein holds a doctorate in psychology from Ruhr-Universitat Bochum and has been in private practice since 1975. He is also a noted author and popular contributor to many international radio and television programs.